Low-back pain is a common and costly problem. This study estimated the effectiveness of a group cognitive behavioural intervention in addition to best practice advice in people with low-back pain in primary care. Over 1 year, the cognitive behavioural intervention had a sustained effect on troublesome subacute and chronic low-back pain at a low cost to the health-care provider. Group cognitive behavioural treatment for low-back pain in primary care: a randomised controlled trial and cost-effectiveness analysis. The Lancet, Volume 375, Issue 9718, Pages 916 - 923, 13 March 2010. 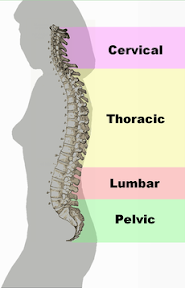 Image source: Different regions (curvatures) of the vertebral column, Wikipedia, public domain.